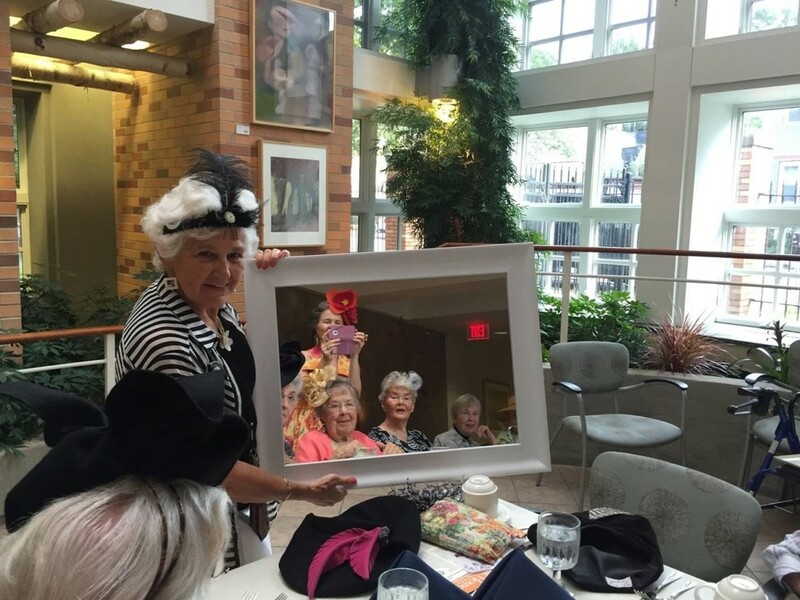 Ildiko Szabo, organizer of the Illuminate Your Spirit evening series at Youville Assisted Living, holds up the mirror for fashion expert (and impromptu photographer) Kathleen McDermott, shown in the reflection with Youville residents Jeanne Wise, Clare Chapman and Mary-Lou Pardue, during an evening “hat party” on Tuesday, August 4th at Youville House. Kathy McDermott, fashion historian and hat designer, joined residents for dinner at Youville House on Tuesday, August 4th. Not your typical dinner guest, she arrived with 30 whimsical hats of her own making, placing a hat at each table setting to encourage residents to wear them. As these photos attest, residents were more than willing to comply! Kathy reminded us how the millinery shops of the 40s and 50s would pay close attention to their clients' facial features when fitting them for hats. Hats could be chosen to accentuate or hide certain features, to create the most flattering results possible. Kathy was adept at matching residents with hats that brought out their most endearing qualities. During the course of pinning the headpieces and finding the right angle, conversation flowed and giggles echoed through the Atrium. Even Youville staff members came to investigate the source of this frolic, and soon became swept up in it! Kathy began to fit staff members with hats, many of whom wore them throughout the evening. This memorable dinner preceded Kathy’s anticipated evening program at Youville: “History of Fashion: 1920s to the 1970s.” Residents – even men! – crowded into the All Day Cafe to hear more from the magnetic “hat lady” who had created such a stir at dinner. Kathy’s presentation, accompanied by slide show illustrations, took us through decades of fashion history. Until the 1920s women wore similar clothes revealing very little of their anatomy. The first liberation movement began with the right to vote in 1919 – was it a coincidence that this was also the time women began to reveal their ankles? Hemlines rose, hairstyles evolved, and hats were a part of it all. The cloche hat became a symbol of “flapper” fashion. Coco Channel introduced knits and the iconic little black dress that liberated women. Hollywood ushered in the 1930s with whimsical, tipped hats matching shiny, slinky dresses. Surrealism and art influenced fashion, reaching the height of expression with the shoe hat! The war years restricted feminine expression. Female fashion reverted to the “strong woman” image, with women dressed in similar, even masculine styles. Hats became one of the few ways to add a personal touch to one’s appearance, and millinery shops sprang up in many towns. The fashion industry dictated what we wore in the 50s and 60s, with women wearing highly coordinated outfits and matching accessories. Gloves, handbags and hats became fashion statements. Then, women rebelled in the 1970s, ending the dominance of the fashion industry. Women joined movements and marched for equal rights. Photographs started to show them wearing what they pleased, with no two women looking alike. These remarkable shifts in fashion were reflected in the living memories of the audience at Youville House. As Kathy facilitated discussion, residents recalled their own personal moments from the bygone eras of fashion. One resident, an MIT professor, recalled when women’s trousers did not have pockets, and she would lose her keys. Others recalled having to hide their feminism to compete in a man’s world. The evening flew by and while we all enjoyed the camaraderie and the laughter an underlying thought went through our minds: we’ve come a long way, baby! Remember when our cameras needed us to twist dials and set apertures? When lugging camera equipment was equal to a workout? When bright orange boxes of film were standard on any trip, and the wait for those precious photos to be developed seemed interminable? Al Wolsky, a dedicated photography buff and collector of vintage Leica cameras, brought memories of these “good old days” to life in a recent evening presentation for residents at Youville House. The presentation began with Al’s description of his experiences taking and developing photos. As his descriptions became more detailed, many residents in attendance connected with their own vivid memories of those bygone days. Al also shared his extensive collection of camera equipment. The audience watched with hushed admiration as he unscrewed lenses and opened up the backs of the cameras to reveal beautiful mechanical simplicity and the precision craftsmanship of each piece. Al’s presentation combined a passion for vintage camera equipment with vivid stories. He shared a portfolio of black and white photographs he had developed himself, spanning a decade. There was growing excitement among the residents as handling the beautiful photos stirred memories and personal experiences of their own. The old model cameras – many of which can be found today in museums – had unexpected stories connected to them. Al related how, during World War II, brand name camera forgeries abounded. The stories of these “fakes” became mysteries in their own right, evolving into detective stories and historical dramas. While telling these tales, Al managed to artfully incorporate his family history using the aid of a family photo album. Fulfillment through Photography evokeda magical time in many people’s lives reminding us how photography offered a special way to stay connected to moments in time. Al Woslky will give this presentation again at Youville Place on Wednesday, March 25th. As Part of the Illuminate Your Spirit Series, Cambridge author Jessica Lander spent a literary evening with residents at Youville Place in Lexington. Lander dined with a group of residents prior to her evening presentation. She read from her recently published work of nonfiction, Driving Backwards. Below, Ildiko Szabo, Director of Community Life at Youville, describes the evening. The dinner group was perfectly chosen; it became lively and chatty in no time. Jessica was a delight when she arrived after battling rush hour traffic. Her youth was eagerly received and added much to the mix. The presentation in the community room was fast paced and of interest to all to the point that I delighted in watching the residents’ faces. You could see their “minds illuminating” with experiences from long ago. Several residents even thanked Jessica for bringing back these memories and leading them to these happy times in their past. Driving Backwards is Jessica’s recently published book about Gilmanton, NH, the most famous town in the US in the 1950s when the popularity of Peyton Place led many to seek out the town where the action in the book and the TV series took place. In her book, Jessica explores the stories of a 99 year old gentleman who recalls events from the past. To understand fully the stories that she weaves, Jessica apprentices with the blueberry farmer and the miniature horse farm owner. Telling the residents about these often common experiences brought the group together. But it was the magic of the star lit sky in a setting unencumbered by city lights and flares that bonded the group. We remembered times when we lay in fields, whether in Minnesota, Canada, or Maine and watched in awe as fireflies and stars produced fireworks that still illuminate the circuits of our minds. Jessica set the mood for sharing. The group opened up and stories flowed. Some lingered and did not want to leave. We held unto the feelings as one by one the residents retreated to their apartments and the magic lingered in the community room even after the last participants had left.